And my, is it gorgeous. Designed by Stacey Lucas with an illustration by Michael Sean Piper, it is a thing of glorious, shambling beauty, sure to inspire wonder, fear, curiosity and all those other emotions that lead to so many awkward moments in your teenage years. Behold and tremble! Posters will soon be up around Dover, Portsmouth and other fine Seacoast locales, so keep an eye out! And don’t forget – we are a mere 15 days away from zombie madness! Mark your calendars, reattach that arm that keeps falling off and get your costume ready! This is it! The moment you’ve been waiting for while trapped in your grave, ravenous for brains! 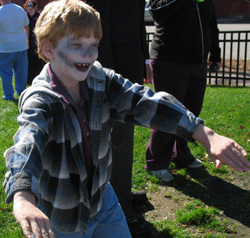 The third annual Dover Zombie Walk will descend upon Dover on Saturday, October 25 at 3 p.m.! Dust the grave soil off your finest zombie threads, brush the ichor off your teeth and practice your best zombie voice (you know the one–that low moan-growl that issues forth from your dessicated throat when you spot a tasty brain)–the Dover Zombie Walk is coming and it cannot be stopped! He's ready for the Zombie Walk - are you? You need details, you say? Of course! Zombi-fied adults and children should gather at Silver Moon Creperie (located at 20 3rd Street, adjacent to The Strand theater) at 3 p.m.–free hot mulled cider will be available for all ghouls preparing for the walk. We’ll set off down Central Ave. beginning at 3 p.m. and will walk down to Adelle’s Coffee House. A corpse-tacular celebration will follow, complete with refreshments, a zombie costume contest and a Jell-O “brain” eating contest. The best-dressed and hungriest zombies will walk away with fabulous prizes, including gift certificates to Nellie Woe’s Comics ‘N Such, Silver Moon Creperie, Adelle’s Coffee House, and SecondRun Books in Portsmouth, a fabulous Dan Blakeslee poster and much more! We’ll be walking rain or shine this year, as no respectable zombie can be stopped by inclimate weather! Come in your zombie finery, but remember, this is an all ages event, so keep things somewhat appropriate (but still spooky!). We ask that all zombies, regardless of age, obey all traffic laws (lest a wayward motorist turn you into a real zombie) and be respectful of any pedestrians that may be on the sidewalk. Yes, their living flesh practically demands to be chewed upon, but please be courteous. Need more information? 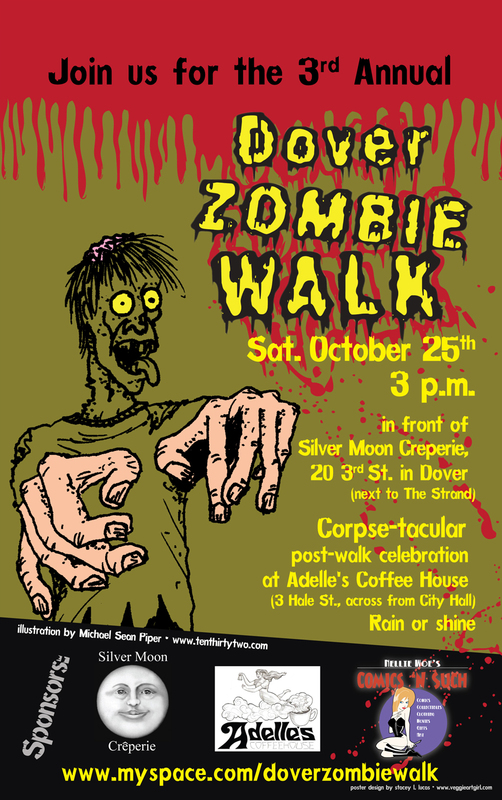 Send us an email at info [at] doverzombiewalk.com! There’s still six months until Halloween, but that doesn’t mean you shouldn’t be thinking about the annual Dover Zombie Walk. We’ve got huge plans for this year’s walk, plans so big that you’d need a pile of delicious brains to begin to comprehend them. But…that’s a story for another time. In the meantime, enjoy this video trailer from last year’s Zombie Walk! You are currently browsing the Dover Zombie Walk weblog archives.